A few review requests have come across our desks recently regarding iPad styli. We have ignored them, mostly because the whole idea of a stylus is pretty silly when the iPad, unlike a Wacom tablet, has no ability to detect pressure. In our opinion, without that key parameter, replacing the finger with a stylus makes little sense. 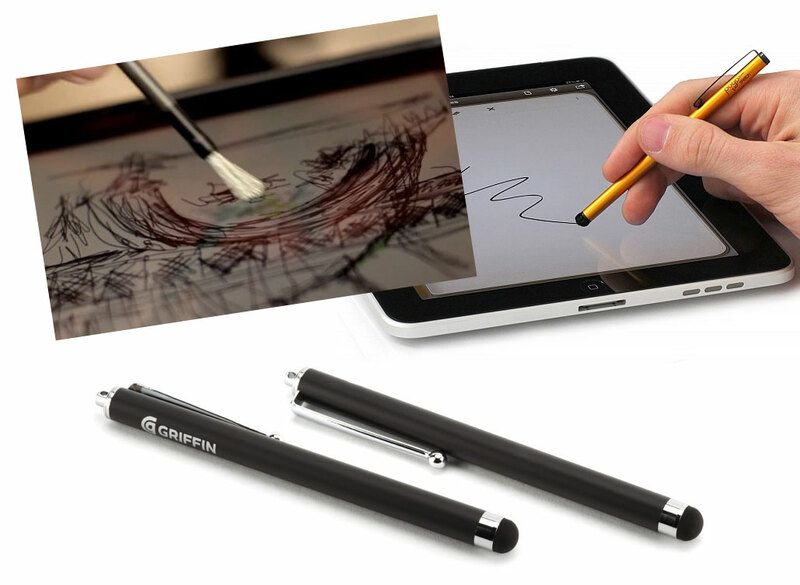 Still, companies press on and offer up styli and brushes (Pogo Sketch, Griffin Stylus, Nomad Brush) for the iPad. After seeing the video of the Nomad Brush in action, we became a bit more intriqued with the potential of such an instrument, even with the lack pressure-sensitivity. Based on our understanding of how the iPad touchscreen works, a “stylus” can be made out of ANYTHING conductive (metal, foam, skin, etc…) as long as it makes contact with the surface of the iPad screen in such a way that it spans a certain distance to register as a touch. iPad stylus are so easy to make (we made one in a few seconds with some copper foil and a wooden dowel) that it wasn’t really worth a DIY write-up. 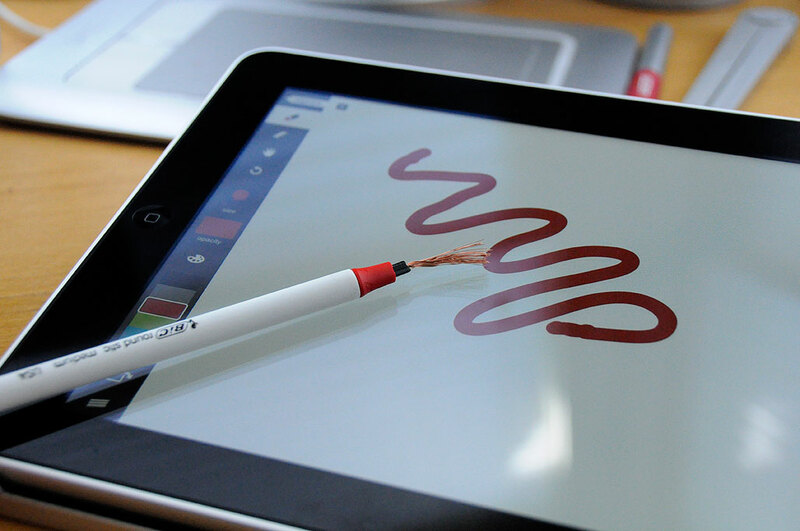 A stylus may be easy to construct, but what about making a brush that would work with the iPad? Knowing what we know about how the iPad touchscreen works, we figured that, in theory, it shouldn’t be too difficult to make a brush that would work on the iPad. The challenging part would be finding the right type of material to make the bristles. In order to make a brush, we need conductive bristles. We have already demonstrated that as long as something conductive makes sufficient contact with the screen’s surface, the iPad will register it as a “touch.” So, a bunch of copper strands should do nicely. The easiest source of ready-made copper “hair” is from an old power cord. A few quick snips, strip BOTH ends, and we had ourselves a nice bunch of shiny copper bristles ready for testing. The Bic pen tube, with its tapered point, made it the perfect brush handle. So in just a little under 30 seconds, we made an iPad brush. Of course, the sixty-four-thousand-dollar question is “Will it work?” The answer is…well enough, but it could be a lot better. 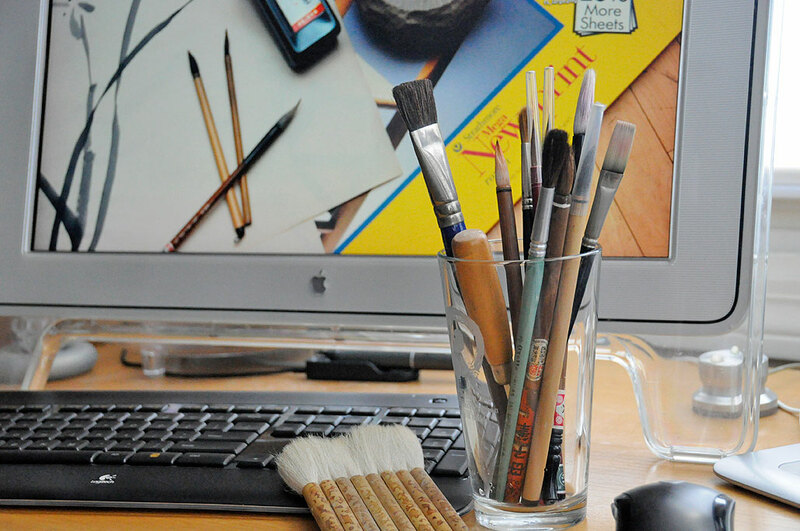 The brush is easily recognized by the iPad and will track nicely across the surface. The copper is too soft to scratch the glass screen. The only problem is that the bristles have no “spring” in them. They will deform on contact and will stay bent. While this is not a big problem, it does not really feel like a brush. Unless Apple changes the fundamental technology behind their current iPad screen or someone adds a lot more technology to the stylus, it will be IMPOSSIBLE to have the kind of PRECISE pixel/brush control like that of a Wacom Cintiq . Any company implying such is being VERY generous in their claims. However, if you want to approximate the feel of using a brush on the iPad, follow our DIY instructions, and make one for a few pennies. We did this RainyDayProject as a proof-of-concept. Our hope is now to crowd-source the search for better brush materials. The ideal material needs to be conductive, flexible, resilient, inexpensive, and gentle on the screen. If/when you do find something which may be suitable, let us know. We’ll give it a try. If it works out, we’ll update this article and give you credit.